A legal team in Southern California trying to create a defense exhibit has come under fire for what some might call "thinking outside the box," but others have suggested might be "illegal human experimentation." George Engman is on trial in West Valley Superior Court for trespassing, public intoxication and resisting arrest after an incident at the Ontario Mills mall in 2006. Engman claims that the police used excessive force when they detained him, and specifically that they shocked him 10 to 14 times with a Taser-style stun gun. (It’s not clear to me how this helps the defense — it’s still trespassing even if you get beaten up for doing it — but the argument may be that he could not have resisted arrest because he was preoccupied with the 50,000 volts he’d been introduced to.) The police say he was only shocked three times. Thus the defense effort to conduct an experiment that would demonstrate the effects of repeated shocks on their client. Specifically, the district attorney raised the question of whether the testing might have violated the "Protection of Human Subjects in Medical Experimentation Act." See Cal. Health & Safety Code sec. 24170 et seq. That law establishes an "experimental subject’s bill of rights," basically constituting the subject’s right to have the experiment fully explained, and requires informed consent. It defines "medical experiment" to include "the use of a drug or device [or] electromagnetic radiation . . . in or upon a human subject in the practice or research of medicine" if that does not "directly benefit the subject." It is unclear whether the client provided his consent in writing (though it seems clear he consented), and according to reports, the consultant admitted he was not certified to use a Taser. But the defense argues that the test did (or was intended to) directly benefit the subject because it is part of a legal defense; maybe so, although a better argument might be that they were not "practicing medicine." And I would also argue that a prosecution for doing this might be barred by California’s "litigation privilege" as well as by various constitutional provisions that protect the right of an accused to present a defense. (I should make clear to my own clients that I’m not planning on experimenting on them any time soon, just thinking out loud.) Engman’s attorney said that the test was necessary to gather evidence because neither the DA nor the stun-gun manufacturer would provide studies explaining the kinds of wounds or marks that can be made by the device. "We had no other choice," he said. "We did it because our backs were up against the wall. It was for the greater good." The district attorney’s office said last week that it was still to early to decide whether the shocker and/or any of the shockees would be prosecuted, but it seems unlikely. A legal expert contacted by ABC News said the claim that the team was engaged in "research" sounded "laughable," although ABC did not report whether he himself actually laughed. 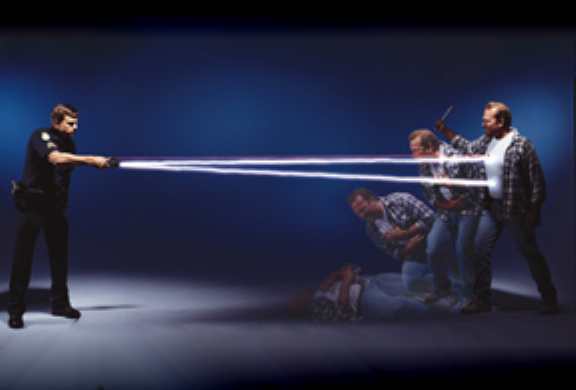 The TASER company’s website provides a lot of research studies, and links to others, though I did not see any studies of the kind the defense was referring to. But there is a lot of fairly comprehensive information on the site that could prove useful to everyone from scientists ("Effect of Varying Dart Separation along the Cardiac Axis on Ventricular Arrhythmia Induction during TASER Application") to the recently unthawed ("To many people, electricity sounds dangerous. Indeed, it can be").